Supported by National Natural Science Foundation of China (81671647, 81771787) and Natural Science Foundation of Beijing (7172069). Abstract: Objective To investigate the incidence and cardiac magnetic resonance imaging features of coronary atherosclerotic artery disease (CAD) in the patients with hypertrophic cardiomyopathy (HCM) or dilated cardiomyopathy (DCM). Methods A retrospective study was conducted on the clinical and imaging data of the patients who had HCM or DCM diagnosed by cardiac magnetic resonance examination and received coronary examination (coronary angiography or computed tomography) from Sep. 2015 to Sep. 2018. According to the severity of coronary stenosis, the patients with HCM or DCM were divided into normal coronary group, coronary atherosclerosis group (lumen stenosis ≤ 50%) and CAD group (lumen stenosis>50%). The incidence of coronary diseases and the clinical and magnetic resonance imaging features were compared among the three groups. Results A total of 681 patients with primary cardiomyopathy were examined by cardiac magnetic resonance. 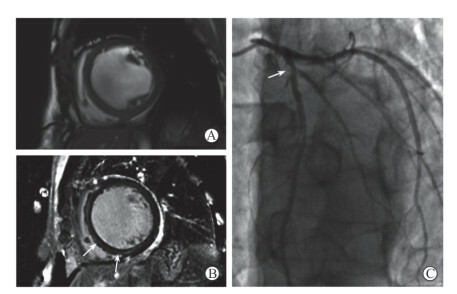 Two hundred and nineteen of them underwent coronary angiography or computed tomography, including 126 cases with HCM, 78 cases with DCM and 15 cases of other types with cardiomyopathy. The incidence of coronary atherosclerosis and CAD in the HCM patients was 31.7% (40/126) and 21.4% (27/126), respectively, which was not significantly different from that in the DCM patients (30.8%[24/78] and 17.9%[14/78], respectively; both P>0.05). In the patients with HCM and DCM, the mean ages of the CAD group and coronary atherosclerosis group were (62.6±9.8) and (60.1±7.2) years, and (59.3±9.5) and (58.5±8.8) years, respectively, which were higher than those of the normal coronary group ([49.5±11.0] and[49.3±12.9] years, respectively), and the differences were significant (all P < 0.05). Both HCM and DCM patients with cardiovascular risk factors (diabetes, smoking, hypertension, hyperlipidemia or obesity) had high incidence of CAD (70.4%[19/27] and 71.4%[10/14], respectively). The left ventricular stroke volume of the CAD group in the HCM patients was significantly lower than those of the normal coronary and coronary atherosclerosis groups ([50.4±21.1] mL vs[64.6±22.9] mL and[64.1±27.1] mL, both P < 0.05). There were no significant differences in the left ventricular end-diastolic diameter, detection rate of intramyocardial fibrosis or other left ventricular function parameters among the three groups both in the HCM and DCM patients (all P>0.05). Conclusion Both HCM and DCM patients can be complicated with CAD. 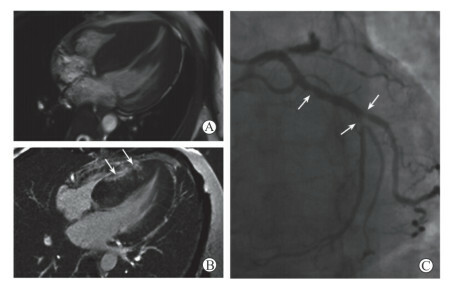 Cardiac magnetic resonance imaging can be used to diagnose cardiomyopathy, especially in the differential diagnosis of CAD with myocardial infarction. 牛保松. 扩张型心肌病合并冠心病再发心肌梗死[J]. 中国社区医师(医学专业), 2011, 13: 29. FEHER A, SINUSAS A J. Quantitative assessment of coronary microvascular function: dynamic SPECT, PET, ultrasound, CT and MR imaging[J/OL]. Circ Cardiovasc Imaging, 2017, 10: e006427. 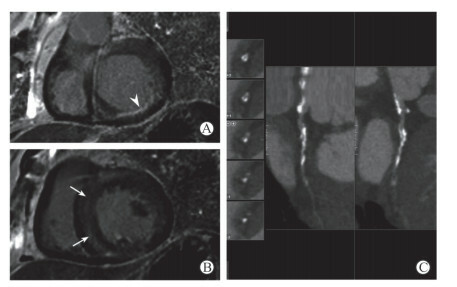 doi: 10.1161/CIRCIMAGING.117.006427.